Given how lazy I am, you’d think I’d have started using a KitchenAid mixer years ago. 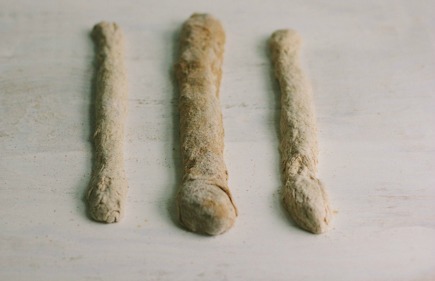 But believe it or not, I’ve recipe-tested for three books using nothing but a wooden spoon or a Danish dough whisk. Well, I’m tired. 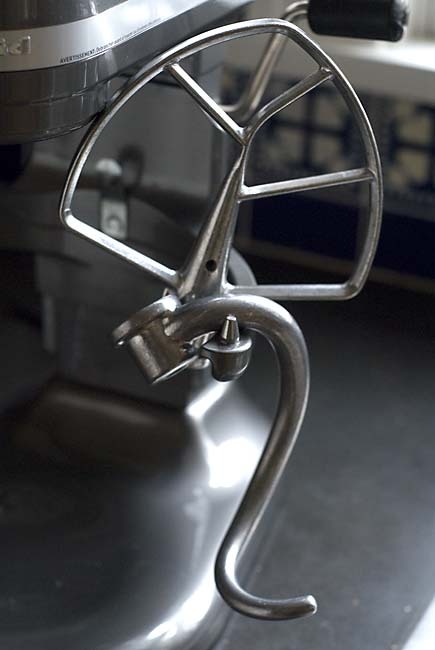 So above, my new KitchenAid Professional 600 series, 6-quart capacity stand mixer, which is an outstandingly beautiful piece of industrial design that hasn’t really changed its look in nearly 100 years. I have been visiting it in the kitchen as a way of avoiding work. More on the mixer in a bit. 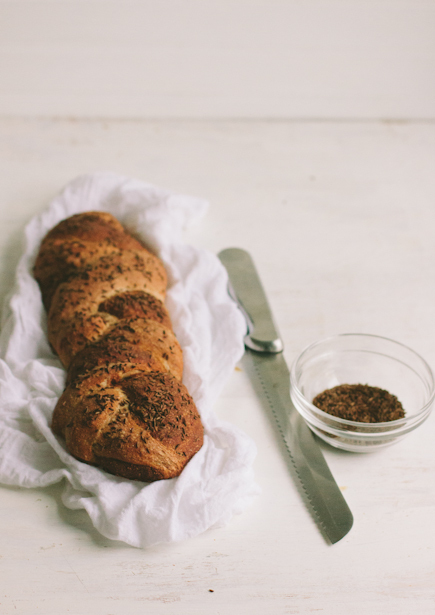 You can find a whole-grain version of this loaf in Healthy Bread in Five Minutes a Day. 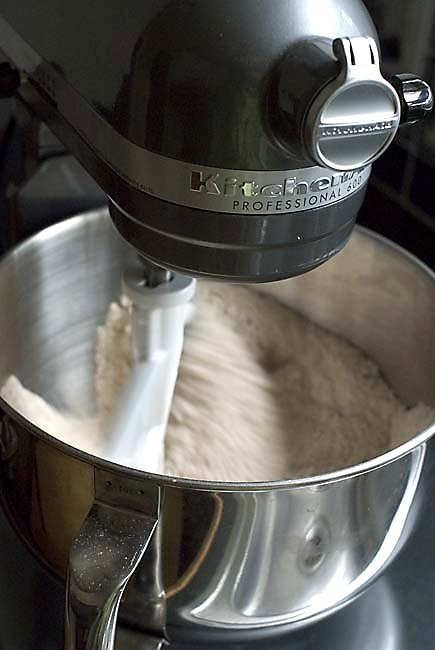 I went with the larger motor (575 watts) and the 6-quart bowl because I make a lot of bread, and sometimes in double-batches from our books (about 13 cups of flour), and if you do that, you need this size mixer. But if you’re sticking with our single batches, you’re fine with the 5-quart bowl and the smaller wattage motors, something like these smaller mixers. I definitely preferred the models with the bowl-lift design rather than the tilt-back mixer head, but play with both before you buy. It’s just a matter of preference but I feel like our wet dough is going to drop outside the bowl when you pull the mixer head back back on the tilt-head models. This machine comes with the coated “bowl-scraping” version of the flat beater, above, and the aluminum version below. 1. Dust the surface of the pumpernickel dough with flour and cut off an orange-size piece. 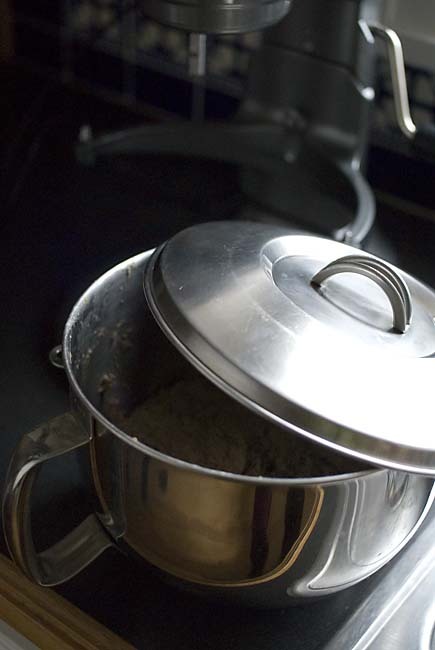 Dust the piece with more flour and quickly shape it into a ball by stretching the surface of the dough around to the bottom on all four sides, rotating the ball a quarter-turn as you go. 2. 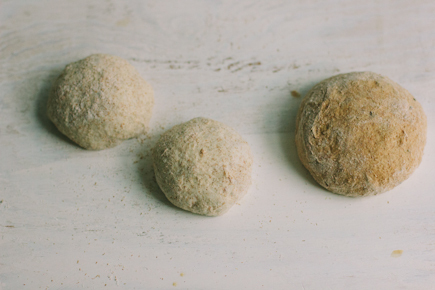 Dust the surface of the rye dough with flour and cut off an orange-size piece. Dust the piece with more flour and quickly shape it into a ball by stretching the surface of the dough around to the bottom on all four sides, rotating the ball a quarter-turn as you go. Cut the ball in half and form 2 balls. 3. 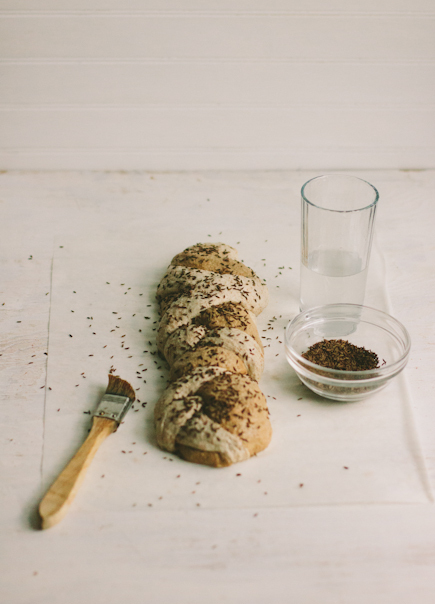 Roll each ball between your hands (or on a board), stretching to form 3 long ropes of equal length (the pumpernickel rope will be thicker because its dough ball was twice as large). 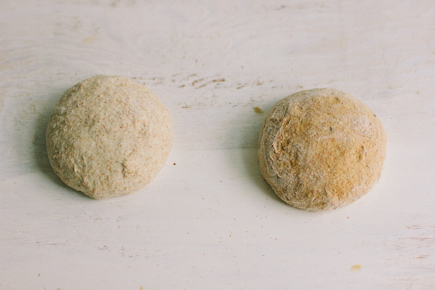 If the balls resist shaping, let them rest for 5 minutes and try again—don’t fight the dough. 4. Line up the 3 ropes, keeping the pumpernickel rope in the center. Braid the ropes, starting from the center and working to one end. If you’ve never done a 3-stranded braid before, it’s simple—just remember to drape one of the outside strands over the center one, then do the same with the other outside strand. Repeat till you reach the end and then pinch the strands together. 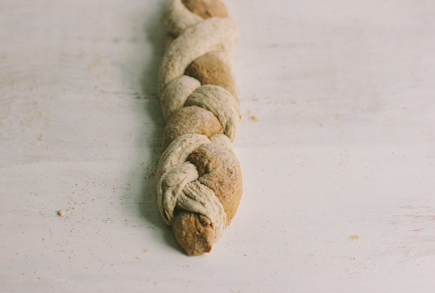 Flip the loaf over, rotate it, braid from the center out to the remaining end, and pinch the ends of the strands together. This seems to produce a loaf with a more uniform thickness than when braided from end to end (though if you like, just braid from end to end). 5. Allow the loaf to rest, loosely covered with plastic wrap, on a pizza peel prepared with cornmeal or lined with parchment paper for 90 minutes (40 minutes if you’re using fresh, unrefrigerated dough). Alternatively, you can rest the loaf on a silicone mat or a greased cookie sheet without using a pizza peel. 6. Thirty minutes before baking time, preheat the oven to 425°F, with a baking stone placed on the middle rack. Place an empty metal broiler tray on any other rack that won’t interfere with the rising bread. 7. Just before baking, use a pastry brush to paint the loaf with water, and then sprinkle with caraway seeds. 8. Slide the loaf directly onto the hot stone (or place the silicone mat or cookie sheet directly on the stone if you used one). Pour 1 cup of hot tap water into the broiler tray, and quickly close the oven door (or see my video for steam alternatives). Bake for about 30 to 35 minutes, until richly browned and firm. If you used parchment paper, a silicone mat, or a cookie sheet under the loaf, carefully remove it and bake the loaf directly on the stone or an oven rack two-thirds of the way through baking. Smaller or larger loaves will require adjustments in resting and baking time. 9. Allow the bread to cool on a rack before slicing and eating. 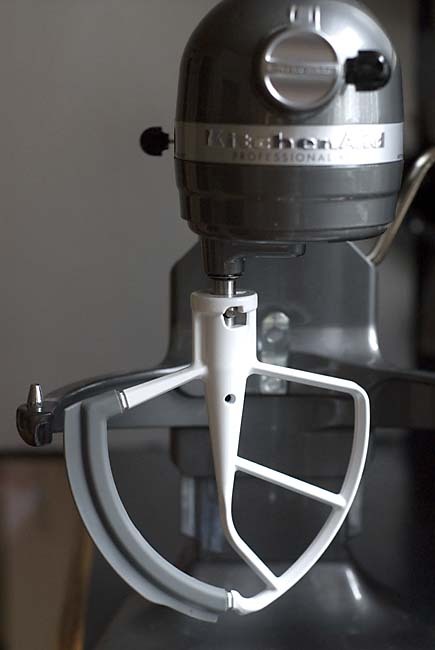 Note: KitchenAid provided the stand mixer pictured for testing and use in this post. I have a Kitchen Aid mixer and was using it all of the time but I got sick of cleaning it so I went back to manual but with I change. I use a Danish wisk to start but then once it gets tough, I switch to a small flat silicone bench or bowl scraper. (I got my from King Arthur). I use that to really dig and fold the dough to get all of the dry bits mixed. It is SO much easier than the spoon or danish wisk alone. Thanks for the tip, sounds like a great method. I enjoy all your recipes for breadmaking but am sort a “saver”. I hate to waste the saran wrap used to keep the moisture in each loaf when rising. I have taken to preparing a cup of water with a tablespoon of corn starch and taking it to near boiling in the microwave. I brush a heavy, wet coat of this liquid all over the surface of the loaf as soon as I am done preparing the loaf for rising. It does two things 1) It keeps the surface from drying out when the loaf is rising and 2) It provides an easily toasted surface coating which allows the bread to brown nicely when it is baked. Just a note from someone who hates to use things once and throw them away. Thank you, this is great. If it is a round loaf I put a large glass bowl over instead of plastic, but that does not work for loaf pans longer loafs. Thanks for this post. I’ve used my Kitchenaid 6 quart in the past. However, I never thought of letting the dough rise in the bowl. Thanks for saving on cleanup. Makes things easier. I’ve started using my Pro for almost all of my bread. My current kitchen doesn’t have enough room for me to knead dough successfully by hand. I tend to let my dough rise in the bowl in the oven several hours after I bake something. Looks great! I’ll be trying it tomorrow (no caramel color in the house, and I think I’m out of molasses). Just a note, I’ve been using my Pro 600 for no-kneads for a few years without issue. I start with the paddle for a few seconds to combine, then switch to the hook for a quick stir, maybe 90 seconds to two minutes. I picked this up from PJ Hamel at KAF and it works every time. 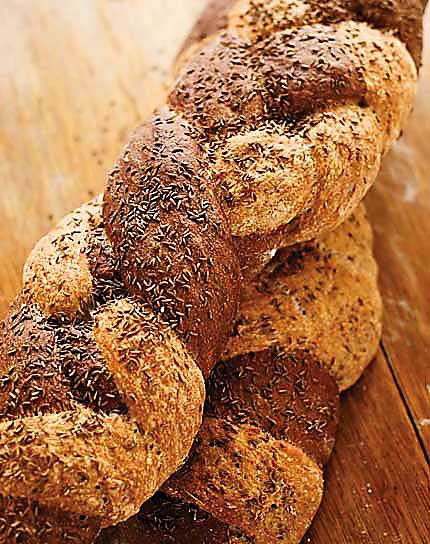 I’ve use the same rye and pumpernickel mix from ABin5 to make a marble rye – love it. My question for today – Zoe or Jeff probably saw the pretzel buns, slider size, in the Star Tribune today. Very cute – I’m already trying to figure out to make them with AB. That dough looks like it might be a little stiffer than AB. I saw Zoe did one before where she “poached” soft pretzels in somewhat similar technique. How can I adapt AB to the recipe, which is sweeter and with butter? I haven’t had a chance to see those buns yet, but I will check them out. We are working on a bun that sounds just like this, so we’ll let you know when we’ve got that figured out. The paddle and hook can be washed in the dishwasher, they will just darken and not look so pretty. I hand wash as it only takes a minute that the machine saves! I use the dough hook all the time (ever since your first book came out) on your dough and when making a bigger batch (always! )it is harder on the motor with the big paddle and the dough hook works better. PS, I do not sell KAid mixers but could! Maybe I am doing something wrong but the I have been making the 5-min a day bread with a bowl and silicon spatula and I simply can not imagine it being any easier. Should I be mixing it more than I am? This method is somewhat new to me. Previously I had been making the no-knead bread with the overnight rise then bake after 8-18 hours so I am not sure if this method requires more mixing than I am doing. Just to amplify Zoe’s comment about making sure there are no bits of flour left after mixing. Unmixed flour does not add to the flavor of the bread. Only fermented flour tastes good. So you want to make every effort to make sure all the flour you add is well mixed. Flour incorporation comes in two stages. The first stage is as you describe in No Knead Bread. That process just mixes the compontents of water, flour, yeast and salt. The next stage of mixing is increasing gluten formation. 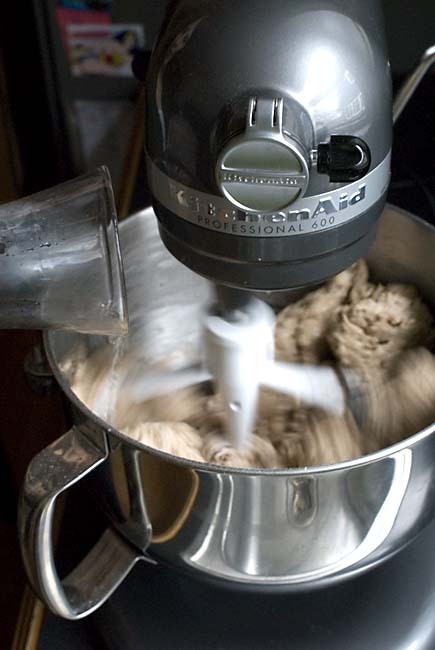 Higher gluten formation is why you use mixers and knead it by hand, etc. The high protein flours we have available today contain sufficient gluten to get an OK bread rise just by mixing such as is done in No Knead Breads. 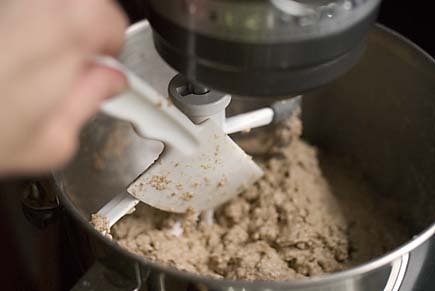 What bakers are finding out is that the new mixers using the high protein flours allow higher gluten formation which makes for lighter breads, smaller crumb, etc. In the oven now! I made a larger (2 lbs) and did a four-strand braid. Never done it with two colours, so I mixed up the order. Still looks cool, though! We can’t wait for it to cool! This post surprised me until I read how much flour, i.e. the large batches you do. I am a household of 1 and a half batch lasts a week so I follow the same procedure as Brian: whisk and then spoon. Great results and I get a little arm workout. I am 57 and a “scratch” cook. I have resisted a mixer to keep using my arms and it makes me think before creaming butter and sugar for sweets I definitely don’t need 🙂 !! – plus even those sweets I tend to make small batches unless I am giving some away. Wonderful instructions on the braid – thank you! I would like to use spent grain from our home brewing in our bread. I use your master recipe from your first book. Can you provide some instruction? *I just spoke to Jeff, who used to make his own beer and he suggested that the spent grains may still have the hulls on them, which would make them too tough to eat and not suitable for bread baking. Is that the case with yours? Thank you! Can I only add it when I make the dough, or do you think I can add it on baking day? Wow. I’ve just made Naan for the first time. It’s past 11:00 p.m and we are tearing the last pieces apart. It tastes great!! I can just imagine how it will be as a pizza crust. What’s the next book you’re working on, if any? I am planning on making the pumpernickel bread from Artisan Bread in 5 Minutes and started looking into buying caramel color. I ran across several articles discussing a concern surrounding the process used to create caramel color (it seems that there are 4 classes of caramel coloring, and that 2 of them are made with ammonia and have carcinogenic properties). I contacted King Arthur Flour to find out which class their caramel coloring product falls into, but haven’t heard back. Do either of you know anything about this and could you provide some direction in the matter? No, that won’t work, you need to blend rye and wheat flours, which of our books do you have and I can direct you to a recipe. Our publisher would kill us if we put all our recipes here on the website! All of our books have rye recipes, click on the book images above to be directed to each book’s Amazon site. I am anxious to make your pumpernickel bread. I am looking at the recipe p. 67-69 from Artisan Bread in 5 minutes a Day. King Arthur no longer carries caramel color. Is it necessary? I have black cocoa that I have used in another recipe for Pumpernickel which gave me a perfect color. I am unsure if the caramel color is just for color or has an important taste component. Thank you for any help you can give me.